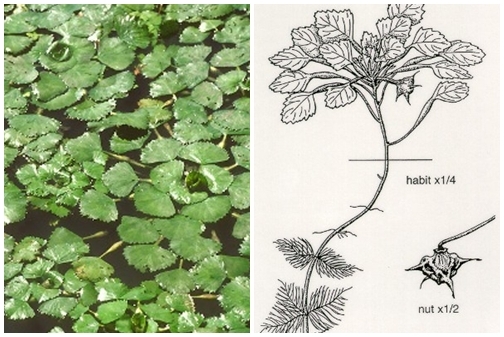 Water Chestnut has submerged leaves that are feather-like in appearance and are oppositely-paired along the stem. The floating leaves are triangular in shape.Its cord-like plant stems can reach lengths of up to 16 feet. Flowers appear in mid to late July, and the plant also produces a horned fruit, the "chestnut". This invasive aquatic plant was introduced from Europe into New York in the late 1800s for its ornamental appearance. Its range has been limited to the Atlantic states, but this range is capable of expansion. Although it is not yet a problem in Maine, water chestnut is a major nuisance in nearby Massachusetts and Connecticut. The major means of dispersal is thought to be through ducks and geese. However, humans are also capable of transporting invasive aquatic plants from lake to lake.